RetroTurbo.com is an authorized re-seller of EcuMaster EMU products. 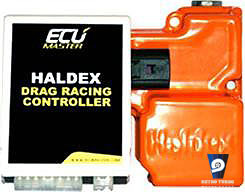 Haldex Drag Racing Controller is an essential device for every competitor using car equipped with a Haldex 4Motion system in drag racing. EcuMaster haldex controller provides possibility of complete engaging during start and automatic disengaging above user selected speed. A huge advantage is the fact that it does not require any additional sensors, which allows to use 4Motion system in cars without ABS. The device can be successfully used in everyday cars, where rear drive engage can be seamlessly adjust with a potentiometer. Full control over rear-drive torque distribution (50% -50%). Control of drive circuit using a potentiometer. Ability to automatically shift torque bias at a set speed. Decoupling drive with the parking brake applied. Full device configuration and status logging using a PC. Interconnect for Haldex module and controller. Modified Haldex module (customer supplied). CD with software drivers and manuals. Notes: Haldex units must be modified for use with controller. Modifications are performed by RetroTurbo UK. Haldex unit must be delivered to our workshop at customers own cost. Please note Your Haldex Unit need to be delivered to RetroTurbo UK. SKU: haldexdragcontroler. Category: Engine Management Systems, HALDEX.